Hey guys! Guess who’s back? I am finally finished with my last semester of college and am super excited to be graduating in December 🎓🎉. I am just as excited to getting back to blogging and catching up with you all…I’ve missed you! ❤ What a relief to be done and have some more time on my hands. I feel like I’ve been living under a rock these past two months. To kick start this wonderful accomplishment in my life and my return to blogging, I am doing another giveaway! 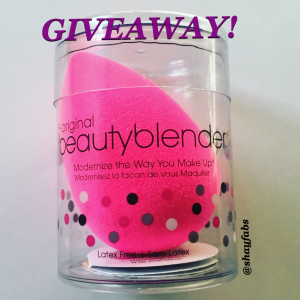 Last time I did a giveaway, I gave away a bodyblender and this time I am giving away a beautyblender to one lucky blogger! So, let’s get to it! Rules are really simple.